I live in a small house. It is so easy for my son’s toys to absolutely overrun the living room, and that is why he doesn’t have a play kitchen, even though playing with his play food is one of his favorite activities. Today, while he was unpacking his Melissa and Doug Cutting Food, I had an inspiration. 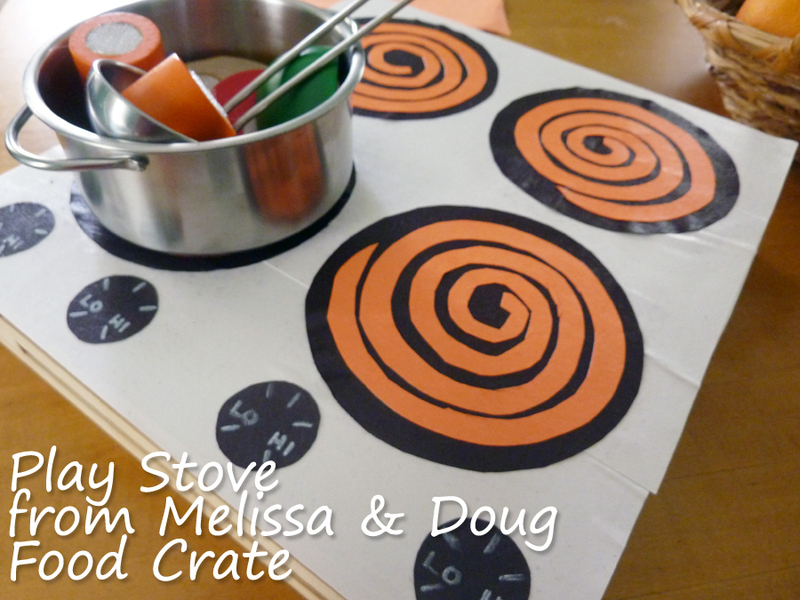 He’s storing his food in this sturdy crate that comes with the food, why not turn it into a stove? Thirty minutes later, we had a (still slightly sticky) easy-to-store stovetop, ready to make peanut butter-and-zucchini soup, or whatever it is he likes to cook. All it took was some construction paper and glue. There are no three-dimensional knobs, so it stores flat on the shelf, with all the food inside. Of course you could make this with a cardboard box or whatever you have lying around. On another day, I’ll make a little cardboard oven to set this stovetop on, with a door and rack, but this was enough crafting for today. The whole process is pretty self-explanatory, but if you’d like more detail, read on! 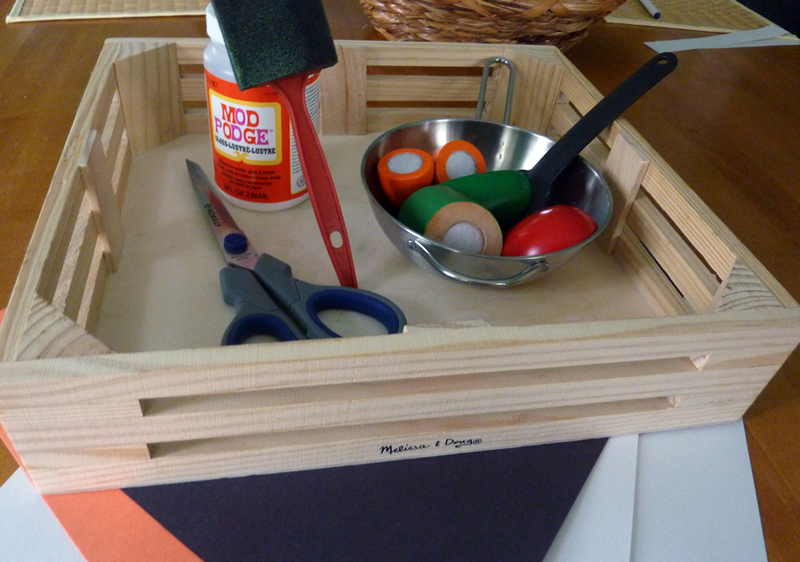 Cut your white paper to fit the surface of the crate. Don’t worry too much about overhang, you can trim it later (I really should have done that before taking pictures. That’ll teach me to try and crank out a tutorial quickly.) 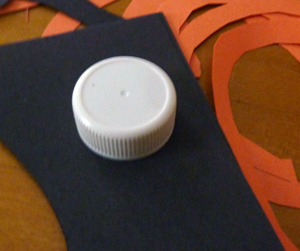 Spread a layer of glue on the surface and adhere the white paper. Try to smooth out any wrinkles (again, I did a horrible job of that.) Paint on another layer of glue. 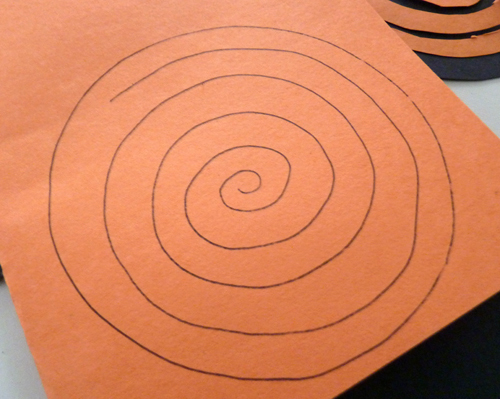 Draw a spiral slightly smaller than the black circles you cut out. 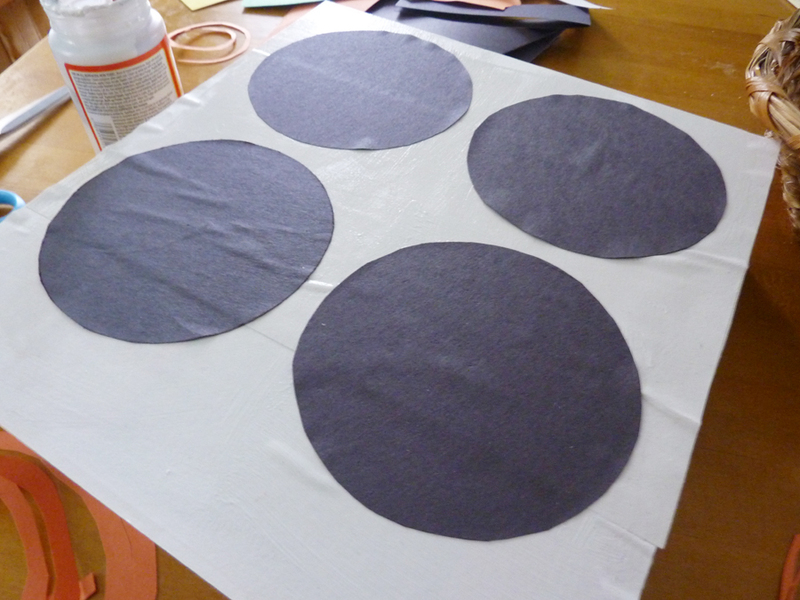 Cut out four identical circles from the black paper – you can use a compass, or trace something round like a small bowl. My circles were about 4 3/4 inches in diameter. Glue these onto the white paper. Draw a circle of the same size onto the orange paper. 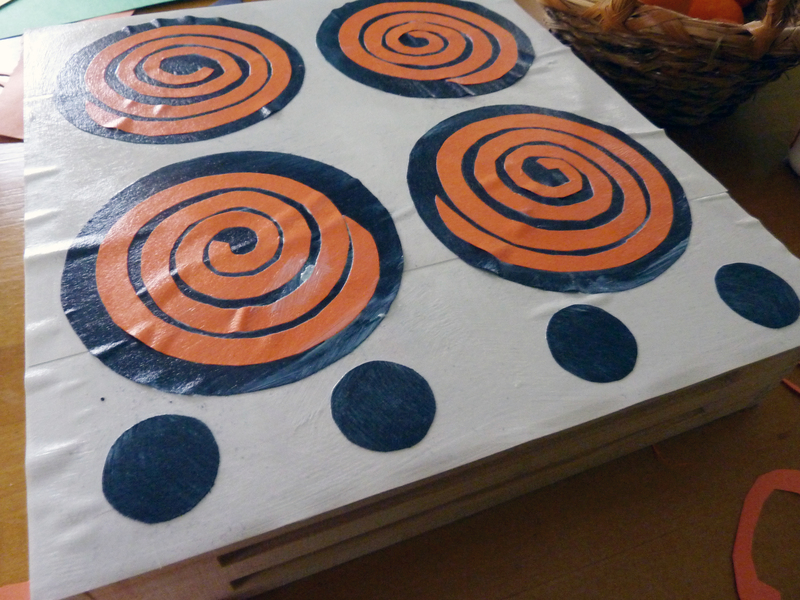 Inside this circle, draw a spiral, freehand, keeping the negative space slightly larger than the desired width of the finished “coils.” Cut along your line. Don’t worry too much if it’s not so smooth – you’ll even it out in the next step. After your spiral is cut, trim a small amount (enough to let the black show through all around the coils) from both the inside and outside edges. Center your coil on one of the black circles, and glue it all down. Repeat for the other three coils. This cap is around an inch in diameter. For the knobs, I just found an object roughly the size I wanted (I used a lid from an almond milk container) and traced it onto the black paper. I cut all four out at a time and glued them to the bottom. Afterward, I gave everything another nice thick coat of Mod Podge. When it had all dried, I marked “hi” and “low” on the knobs with a white paint marker.